There is only few authors whose novels receive a board game adaptation. Making a novel into a game requires a lot of work. Many stories just don’t translate well at all, and to make them work in a game the designer needs to come up with ways to re-create the narrative and at the same time avoid putting the players on rails. This is by no means an easy task, so games based on novels only tend to pop up for a few very popular authors. The one author that comes to mind is, of course, J.R.R. Tolkien. Even discounting the countless publishers jumping on the bandwagon after the Lord of the Rings movies and pasting a Middle Earth theme on everything from Risk to Yahtzee, there is an enormous amount of games based on Lord of the Rings and The Hobbit. But when counting games, there is another author who turns out to be impossible to ignore: H.P. Lovecraft. Must be something about having cool initials, I have to keep that in mind for my novelist career. While fewer people appear to have actually read Lovecraft’s mythos stories compared to Tolkien’s magnum opus, anyone with a slight interest in fantasy literature will know about them. Especially Cthulhu turned into a veritable meme machine, and it’s probably safe to assume that everyone that uses the internet for more than just email has met him. 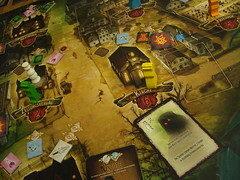 With this popularity, adapting his works into games must have seen a pretty obvious choice, and Cthulhu and his mythos mates spawned a wide variety of them, ranging from their own line of Munchkin games (Munchkin Cthulhu, obviously) through the Call of Cthulhu Living Card Game to the epic size board game Arkham Horror and it’s numerous expansion – one of the few board games that has more parts than a Space Shuttle. The one thing that Lovecraft inspired that Tolkien can not boast with is writers building on his work. Sure, Tolkien inspired generations of high fantasy writers, but few of them became famous with their own stories set in Middle Earth. Lovecraft’s mythos, on the other hand, is one of the first and maybe the most successful shared fictional universe, with many writers all over the world building on his works and setting their stories in his world, and then even get games based on their own stories. Which finally brings us to Witch of Salem, a cooperative game based on a series of novels by German author Wolfgang Hohlbein, based in turn on Lovecraft’s works. Now, there is two things I have to clear up at this point. First, the German title of the game is Der Hexer von Salem, so the witch in question is without any doubt male. Second, I have a long-standing love/hate relationship with Mr. Hohlbein. When I was in my teens, I used to read many of his books. Much of what he writes is adolescent fantasy, so that would appear to be the point. Later, I came to the conclusion that he is suffering from what I like to call Stephen King’s Disease: the inability to write a satisfying ending. Additionally, the series of novels about the which Robert Craven seems to miss the tone of the Mythos Universe by a long shot. The cosmic horrors created by Lovecraft were horrifying because they were incomprehensible. They didn’t have goals that mere humans could understand, yet their presence was enough to drive people insane. In the Witch of Salem novels, they were much more conventional monster horror creatures whose plans could be understood and thwarted. But I’m supposed to write game criticism here, not literally, so I will try to ignore these points and focus on the game now. Witch of Salem is set in the beautiful town of Arkham. Massachusetts , home of the famous Miskatonic University, where the Great Old Ones are trying to rise from their prison in the sunken city of R’lyeh. Robert Craven, the witch of Salem, is in town to stop just this from happening, with the help of the players. Also present is his arch-enemy, the evil wizard Necron, midwife to the Great Old Ones. Necron is another issue I have with Hohlbein’s writing: I’m used to bad guys being easily identified by their name – I recently fought my way through a book where a character called Yawgmoth turned out, to the surprise of everyone present, to actually be evil. Sauron and Mordor are not very subtle on the light-dark scale either. Necron is just too much, why not go ahead and call him Doomfried? When we were playing the first time, someone came up with the name “Onkel Kapuze” (Uncle Cowl) for him, and it stuck hard. Your task as a player is to move around the city of Arkham, identify the locations of two to four portals and seal them while also finding out which Great Old One you are fighting and finally banishing him back to his prison. 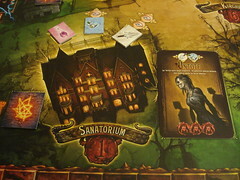 Arkham, beautifully illustrated on the game board, has 6 locations of interest: Miskatonic University, the sanatorium, the newspaper publisher, the witch’s cottage (almost certainly a different witch from the witch of Salem), the inn, the cemetery and the church. Every one of these has a potential portal, determined by a face down chip placed before the game starts and three useful items. You move between those locations by playing the card for it. Every player has a set of cards that contains one card per location plus a secret passage that can lead anywhere at the cost of one point of sanity. Each card is usable once, and you only get them all back by returning to the university. Before each round, the starting player turns the next creature card(s). One in a two player game, two in a four-player game and alternating between one or two with three players – a slightly clunky mechanic, but it works. If the card is the first of it’s kind, it goes haunt of the Arkham locations, waiting to eat players. If it’s the second card of that kind, bad things happen. What exactly happens depends on the creature. The second Undead, for example advances Onkel Kapuze three squares on him doom track. Other creatures make you lose items or sanity. The Witch (not the witch of Salem, and presumably neither the witch that lives in the witch’s cottage) is an especially nasty creature, she shuffles all unsealed portals, setting your detective work back by a long time. At least our edition of the game rewards careful reading of the manual in this phase: the manual clearly states that there is two cards of each type of creature, but our actual deck of cards contained 5 Undead, 4 Witches and assorted other superfluous critters, making the first two game much harder until we discovered our mistake. Play a card and move to a new location. If the card is the secret passage, the player can move to any location (including R’lyeh) at the cost of one sanity. Every player starts with 6 sanity, and everyone reaching zero is out of the game. Encounter another player. If more players are present at the same location, you may give, receive or trade one item to, from or with exactly one of them. Encounter a creature. If a creature is present at the location, players arriving there have to roll the loss dice, losing either an item or a point of sanity or advancing Onkel Kapuze by one square. If the witch (the real witch of Salem this time) is present, you avoid this loss. Only after that you may defeat the creature. To do that, you just need to have the right combination of items with you. You don’t have to discard them, just having them with you is enough. The creature card is then removed. Use an item. You may use one item from your inventory (which holds three items and one artefact) and benefit from it’s effect, then discard it. Magical Glassesenable you to see portals. Using the magical glasses you may check the portal chip at your location to see if it’s an actual portal or just a brick wall. Talking about what you see is forbidden. The Necronomicon contains knowledge about the Great Old Ones. 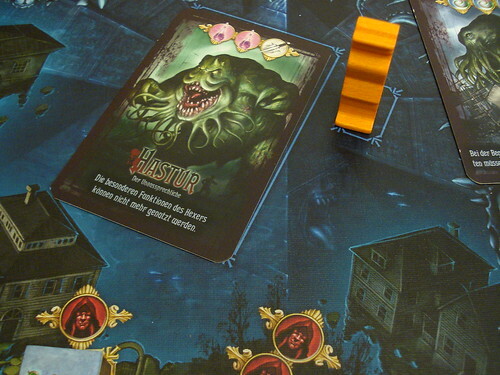 Each Necronomicon used reveals one of the GOO cards. The first five cards show you – again on amazingly illustrated cards – which GOO you are not fighting. The sixth one, finally, is your real enemy, and revealing him puts his evil aura into play, making the game much harder from that point on. The Elixir of Nus restores one point of sanity, or two if the witch is at the same location. The Dagger can defeat any creature, but only if the witch is present, too. And finally, the three different colours of Artefacts can be used to seal a portal. Finally, you may pick up one item. All locations have three items, the first of which is always free to take. The other two have a price to pay for them: either one of the already familiar losses, in extreme cases even losing two points of sanity or advancing Onkel Kapuze by two squares, or having to turn an additional creature or event card. Doesn’t sound very appealing, but new items only show up at a location after all three are taken, so you’re not given a lot of choice. After the last player had her turn, one event card is drawn and executed. Event cards do two things: they move the witch around the board, always a certain number of locations ahead, and cause something special to happen. This special thing can be caused by the witch, then it will be beneficial to the players, a creature may be defeated or players might restore some sanity. On the other hand, the event may be caused by Onkel Kapuze, who is not the most helpful of people. Players may lose sanity, creatures may show up or the shadow of a Great Old One may fall upon Arkham. Having a shadow show up is not fun at all, it applies the evil aura of that Great Old One to Arkham. To give you a taste of how unpleasant that is: Cthulhu’s aura makes you roll twice every time you encounter a creature.Yog-Sothoth makes beneficial event cards not have any effect. These effects stay in play until the shadow can be defeated at the university. After doing this for some time, you may be lucky enough to go to the end game: banishing the Great Old One. After you revealed the Great Old One card in R’lyeh and preferably after you are certain that all open portals are sealed, one player sets out through the secret passage to R’lyeh. Once there, he uses the three items depicted on the Old One’s card to banish him. Time is of the essence now, because this player will lose one point of sanity on every turn, and when he goes insane, the Great Old One will break free again. While the Old One is banished, another player has to return to the university and seal the portal there with any artefact. If you managed to do this before Onkel Kapuze went to the end of his doom track and before everyone went insane, you win. Or maybe not, because after the university portal is sealed, all the other portal chips are examined. If an active portal was not sealed, you still lose. If you accidentally sealed a location that did not have a portal, you also lose. If you don’t die early in the game, getting to the end will take you about an hour usually. And after you won the game once or twice, you are likely going to stop playing it. But lets talk about what I like about the game first: it looks amazing. The city of Arkham, the creatures, the Great Old Ones, the character tablets and even the little item chips are all beautifully illustrated by Franz Vohwinkel and set the mood for the game fabulously. But what I dislike about the game is the fact that it completely fails to deliver a story. It proudly displays all the right names for a Cthulhu Mythos horror story, but the horror just doesn’t set in. The game doesn’t produce the same sense of escalation as other cooperative games, there is no arc to the game. You do the same things in the same situations at the end as at the beginning of the game. The mechanics seem disconnected from the theme, and there is just no reason why creatures do what they do, why the Great Old Ones have the auras that they do, and why the items are used the way they are and then disappear. Additionally, the mighty Witch of Salem, veteran of many fights against the Great Old Ones, he who has protected the world from them so far, is moving around Arkham like he was drunk. He just shows up at random places, and his abilities on the board, while helpful, are sadly disappointing considering how powerful a witch Robert Craven is supposed to be. At least some measure of control over where he goes would have gone some way to make him seem more pointless. As he is, staggering drunkenly around Arkham, we had games where he didn’t show up in the place we needed him a single time. As much as I want to like the game, being the Lovecraft fan that I am, I am sad to report that it just didn’t draw me in and didn’t deliver what I was looking for. 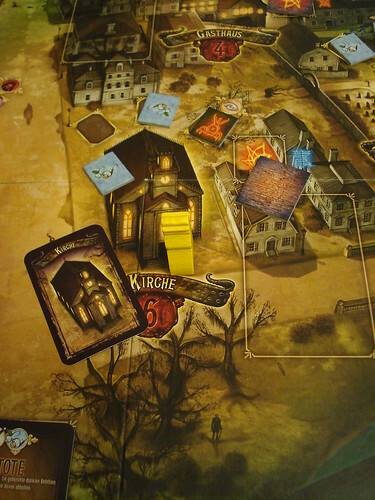 Before I try to hunt down a copy of it here in Germany now, can anyone please leave a comment telling me if Arkham Horror suffers from similar problems?